October 31, 2017 marks the 500th Anniversary of the Protestant Reformation. For this commemorative occasion, occurring only once every seven generations, we will be presenting a decade long work of ours in the capital Sofia. 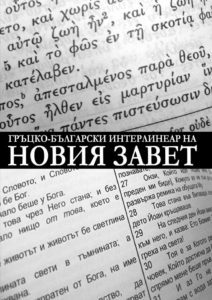 On All Saints Day 2017, the first edition of the Greek-Bulgarian Interlinear of the New Testament from the critical edition of GNT will be released. 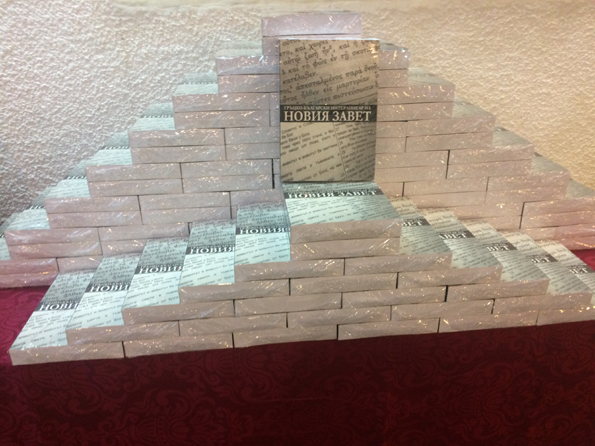 A symbolic stack of the first 95 copies arranged at the presentation will commemorate the work of the great reformers. The Jerome Bible Commentary states that the Gospel of Mark was written in AD 64, immediately after the death of Apostle Peter (Mally 22). Lane agrees with a date between AD 60-70, but definitely before the destruction of Jerusalem (21). Anderson uses the same time pointer in his conclusion that Mark was written approximately AD 65-70 (26). Lane writes that the Gospel is anonymous, but traditionally linked to Mark (21). This affiliation derives from the traditional view, which describes Mark as one of Peter’s associates. The Jerome Bible Commentary identifies the author as John Mark from Acts 12:12, 25 and Mark from 1 Pt. 5:13 (Mally 21). The Interpreter’s Bible points out that the author is obviously not an expert of Judaism, and does not recognize the importance of the accurate description of the historical situation. For example, he calls Herod “a king,” while Herod is only “a governor” under the Roman rule (Grant 637). This characteristics of Mark’s account incorporate both his audience and his intent of writing. Anderson’s opinion is that Mark wrote to the Gentiles in the Roman Empire (29). On the other hand, The New Interpreter’s Bible states that both Syro-Palestinian and other ethnic groups of immigrants, forming minority communities in the Roman Empire, were among Mark’s audience (515). Mark is also the earliest attempt to reduce the apostolic tradition to a written form. This makes his account the source for any further Gospel writing (Lane 1-4). Mercer Commentary of the Bible goes even further to suggest, that “before Mark there was no genre of literature known as Gospel” (Dowd 975). To further describe the life situation of the writing of the Gospel account, Anderson points out that Mark’s attempt to promote Christianity was done in a time when martyrdom was a reality (25). Mercer Commentary of the Bible defines The Gospel of Mark as “a popular ancient biography, written from the presumption of the apocalyptic world-view” (Dowd 975-76). At the same time, Schweizer writes that the account is lacking biographical information (39). Anderson also agrees that Mark’s purpose was to present the person of Jesus, and not a biography or history (3). Because of his traditional association with the apostle Peter (1 Pt. 5:13), it is suggested that the purpose of Mark was to introduce Peter’s preaching in written form. Lane presents an interesting comparison between the structure of the Gospel of Mark by chapters and the account of Peter’s sermon in Acts 10:36-41 (7-11). The Jerome Bible Commentary points out that the structure of Mark can be divided both according to Geographical and Theological characteristics. The Geographical division is determined according to the travels of Jesus through the years of His ministry. On the other side, the Theological frame has two major divisions: the Ministry of Messiah and the Ministry of the Son of Man (Mally 22). While Anderson disagrees with the existence of Q, Schweizer believes that Mark has used the Q-document as a source for his Gospel account (Anderson 4). Another proof that Mark is the first Gospel, is the fact that its structure has been closely followed by both Matthew and Luke (Anderson 2, 4). In the Gospel of Matthew, chapters three and four, Matthew follows the Markan narrative, but also attaches additional information from Q. Evidence for the use of information from Q is the obvious contrast between the length of the Gospel accounts (Schweizer 11). Finally, the structure of Mark is compressed, but not chronological (Anderson 32, 34). The ending of the Gospel has been suggested to have a short and long version, excluding and including the passage of Mk. 16: 9-20. In both of the cases, it differentiates form the Markan style of writing and was probably edited later in the second century (Grant 645). The Interpreter’s Bible points out that the composition of the Gospel was based on oral tradition (Grant 634). Form Criticism characterizes the structure of Mark as episodic, where the different episodes in the plot of Mark are linked by words like, “immediately,” “again,” “and” (Anderson 7). 1. Circumstantial details which were not of theological significance for the Early Church were preserved in the Markan account. 2. Eyewitnesses were present in the Early Church to check the accuracy and fullness of the written Gospel. 3. Transmission was not a free process, but rather a continuous transmission with specific set of rules without rules and limitations (Anderson 15). Redaction Criticism, however, suggests that the style of writing is usual for Mark. Proof for this is the great number of various repetitions and stories, embedded within each other (Perkins 510-11). Mercer Commentary on the Bible points out that the literary criticism structures of inclusion and chaism are among the main forms of repetition in the Markan Gospel account, where the inclusion is “a frame defined by the starting phrase,” and the chaism is “even more extensive repetition” (Dowd 975). The New Interpreter’s Bible states that the structure of the Gospel is such that individual narratives cannot be treated apart form their proper place in the story (Grant 512). The following paragraphs are dedicated to highlight the most important aspects and annotations of Mark 10, combined with the view of different commentators on the application of different kinds of criticism on the Markan text. The mentioning of the house in this passage is not recorded by Matthew (Mt. 19:10-12) (Schweizer 383). Lane shows an interesting sequence that starts with the question of the Pharisees, continues through the Jewish tradition, provokes the Rabbinical interpretation of Moses and reaches to the heart of Creation narrative (356). The idea is that through His question Jesus challenges the legal system of the Jews. While The Jerome Bible Commentary defines only v. 12 as a pronouncement, Lane argues that the whole passage is a pronouncement story (Mally 44, Lane 356). Mark 10:10-12, however, is definitely not a pronouncement story. Anderson provides an interesting analogy between the teachings of Paul and the structure of Mark. He compares 1 Cor. 7:10-11 and Mk. 10:11-12 finding similarities between the doctrinal teachings of the Church on the marriage and divorce, presented in different contexts by both Paul in Mark (39). According to Taylor, Mk. 10:1 is proto-Lukan, and vv. 2-9 is pronouncement story (Taylor 64). Bultmann describes Mk. 10:1-12 as a scholastic dialogue apophthegm (Bultmann 21). There is a problem with Mark’s geographical note 10:1. It seems like Mark did not have accurate information about the place and the time of this story. Matthew updates the location mentioned by Mark from “Judea beyond Jordan,” “Gallilee” which Jesus left in order to go to Judea. Also, in Matthew the crowd follows Jesus, while in Mark a new crowd gathers around Him. Jesus’ style of ministry is also different. While Mark states that He “taught” the crowds, Matthew accents the healing ministry of Jesus. In Mark 10:2 there is a difference between the questions, which the Pharisees ask Jesus. Matthew adds “for any cause” to the words of Mark. In Mark 10:3-9 there are no major differences among the Gospel writers. In v. 3 the Pharisees refer to Dt. 24:1, where Moses allowed them to giver a certificate of divorce. Mk. 12:6 is a quotation from Gen. 1:27; Mk. 12:7 from Gen. 2:24. Verse 9 may be the limit of the pronouncement story. In 10:10, Mark records the words as a question asked by the disciples, while Matthew presents it as a saying of Jesus. 1. Celibacy is better (Mt. 19:10). 2. Celibacy is not for everyone (Mt. 19:11). 3. Celibacy may be natural (Mt. 19:12). 4. Celibacy may be forced (Mt. 19:12). 5. Celibacy may be sacrificial (Mt. 19:12). 6. Celibacy may be commanded (Mt. 19:12). The blessing of the children seems like an appropriate continuation of the pronouncement on the divorce sanctity of marriage (Lane 359). The passage is recorded by all three of the Synoptic writers; however, the narrative is more objective in Mark than it is in Matthew’s description of the event (Schwitzer 384). The original story in Mark 10:13 is the story of the children being brought to Jesus “to be touched” by Him. Matthew changes the verb to “laying of hands.” Obviously his perspective on the Doctrine of Laying of Hands was important at the time of writing. Luke, however, revises the little children to infants, making the range of their age wider, which was probably significant for him. In 10:14 Mark describes Jesus as being “indignant.” Both Matthew and Luke, who obviously did not like this characteristic as a part of Jesus’ personality, omit this word. While Luke agrees with Mark 10:15 on the “receiving” the kingdom of God, Matthew accents on the “changing” and “becoming,” which refers to the Doctrine of New Birth. Matthew also focuses on a particular phrase he likes to use, namely the “Kingdom of Heaven”. He uses this phrase as a replacement of the “Kingdom of God” used by both Mark and Luke, probably to escape any vain pronouncement of God’s name. Mark 10:16 is in a correlation with 10:13 where Mark uses the word “touch.” The same phrase is used by Matthew, but omitted by Luke. Taylor agrees that this is a pronouncement story, probably formed in the second period of Gospel Formation (Taylor 72, 148); however, vs. 15 may have been added in the last period (Taylor 106). Bultmann calls these passage a biographical apophthegm (Bultmann 32). Verse 13-16 is often used by religious groups and denominations to defend the doctrine of infant baptism. The text, however, talks about Jesus blessing the children, and not baptizing them as some may propose. 1. Conversation between Jesus and the Ruler. 2. Saying of Jesus to the disciples on the entrance of rich men in the Kingdom. 3. Blessings for the disciples. Mark 10:17-27 is a single unit expressing the essence of Jesus’ teaching on the entrance into the Kingdom (Lane 363). Mark 10:24b-27 is not a passage about riches, but about God’s freedom to give salvation to whomsoever He wills (Mally 46). Taylor defines this passage as a pronouncement story (Taylor 64, 66). Bultmann, however, divides the passage. According to him, vs. 17-22 are scholastic dialogue “genuine apophthegm,” vs. 23,25 are logia sayings, and vs. 26 “serves as the introduction point of a new saying” (Bultmann 21, 75, 331). In 10:17 only Mark mentions that Jesus was preparing for a journey. Mark uses the adjective “good,” which obviously, created a problem for Matthew who uses only the word “Teacher.” Luke, however, follows Mark’s structure. All three Synoptic writers have different description of the man. While for Mark he is only a “certain man,” for Luke he is a ruler, and for Matthew he is someone who he later calls “a young man” (Mt. 19:20, 22). In 10:18 there is no difference between Mark and Luke; Matthew omits good teacher as a natural continuation of the context created in the previous verse. In 10:19 both Mark and Luke suggest certain that the man had certain knowledge of the law. Matthew, however, has doubts about his proficiency in it. 1. Luke changes the order of the first two, putting You shall not commit adultery before You shall not murder. 2. Mark lists You shall not defraud , which is not one of the Ten Commandments. Since this is an obvious error in the words of Jesus, both Matthew and Luke fix this in their lists. 3. Matthew adds You shall love your neighbor , which is not one of the Ten Commandments, but is a commandment in which Jesus incorporated some of them. In 10:20-21 Mark and Luke agree on the phrase since my youth, while Matthew carefully omits it since it is in a contradiction with his following statements about the age of the man (Mt. 19:20, 22). In 10:22, among the three Synoptic Gospels, Mark has the most vivid and descriptive reaction of the man. According to Mark, he is shocked from the radical words of Jesus and grieving because he is not willing to completely follow them. Matthew omits the shock. Luke reduces the emotional condition of the man to being sad. The financial status of the man is the reason for his lack of spiritual success. According to Mark he possesses many possessions. Matthew carries the same idea. Luke simply describes him as being rich. Verse 22 ends the narrative and is followed by various sayings of Jesus related to the wealth and the kingdom. Verse 10:23 contains the same contrast as in v. 15 appears. Matthew uses the phrase Kingdom of Heaven, while both Mark and Luke use the Kingdom of God. In 10:24 Mark’s repetition of Jesus’ words is later omitted by both Matthew and Luke. In 10:25-27 There is no major difference between the three Synoptic writers in this passage. It is interesting to notice that comparing to vv. 15, 23 even Matthew here uses the phrase the Kingdom of God in v. 25 in agreement with both Mark and Luke. Mark 10:28 is defined by Bultmann as speech material also understood to be a transition (Bultmann 330). “We left everything” in Matthew and Mark is replaced by ”We left our homes” by Luke. Mark 10:29-30 are according to Bultmann “a prophetic saying” (Bultmann 110). Briggs describes it as a promised reward for self-denial. This is one of Jesus’ sayings, which casts Him the role of a Prophet (Briggs 78). Both Matthew and Luke expand Jesus’ saying. Matthew adds the enthronement procession of Jesus and the apostles over the 12 tribes of Israel. Luke adds to all of the above the Kingdom. Mark 10:31 is a “floating saying.” In 10:30-31 the list is pretty much the same, beside the changes in Luke, where he replaces fields with wife. Luke also replaces the phrase for my name’s sake with for the sake of the kingdom of God. He also changes the hundred fold from Mark and Matthew to very much more. Mark repeats the list pattern similar to v.24, where he uses repetition to stress the importance of the passage. All three of the Gospel accounts contain the same eschatological promise. Mark 10:32-34 can be taken together with Mk. 8:32-33; 9:30-32 because of similarities in the structure of these passages (Taylor, 40, 149, 179). Bultmann describes it as “pure esoteric instruction” (Bultmann 331). It is also the third passion prediction with locale in vs. 32(Marxsen 73). The term amazed is used only three time in the New Testament, only by Mark (1:27; 10:24) (Stein 261). Luke and Mark do not record The Parable of the Laborers in the Vineyard. It exists only in the account of Matthew, in progressive correlation with the eschatological promise from the previous verse. 3. Third Passion Prediction (Mk. 10:32-52) (Dowd 975). Lane suggests a comparison between the three Passion Predictions and the Passion Narrative (375). The above table shows a possibility that Mark’s description of the Passion was after the resurrection, since all the details of the passion are pointed as a part of the prophesy a Jesus. The journey in 10:32 is the one that Jesus was preparing for in Mk.10:17. As it was earlier noted both Matthew and Luke omitted this preparation. At his point Matthew mentions the direction of the Journey, while Luke remains silent. Mark 10:33-34 is the words of Jesus’ prophecy. Both Luke and Matthew record the event. Only Matthew refers to the killing of Jesus as a crucifixion. Luke adds to the story the misunderstanding of the disciples. The Enthronement Promise required from Jesus by the mother of the Sons of Zebedee is a new eschatological element (Schwetizer 385). Anderson writes that the cup can either be a symbol of joy (Ps. 16:5; 23:5; 116:13) or of suffering and punishment (Ps. 11:6; 75:8; Is. 51:17, 22) (255). In 10:35 Mark records that the brothers themselves came to ask Jesus, while Matthew changes the story to their mother coming to Jesus and asking. Luke does not record this particular story. In 10:36-40 The dialogue here remains unchanged; however, in both records Jesus’ answer is given to the brothers and not to the mother. Matthew omits the reference of Mark to Jesus’ baptism in vv. 38, 39. In 10:41-44 Luke suggests a dispute between the disciples, which is not in a parallel with Mark’s segment. The dispute is most probably a reference to the record on the Sons of Zebedee in the previous passage. The comparison between the Gentile civil-authority structure and the disciples remains the same through all three Synoptic accounts. Mark 10:45 contains another comparison between the disciples and the purpose of Jesus’ coming. It is omitted by Luke, who adds a rhetorical question as a conclusion to this passage. According to The New Interpreter’s Bible, this passage is the final healing miracle (655). Lane also agrees on this point (Lane 386). The Jerome Bible Commentary states that this miracle, combined with the healing of the blind man in Mk. 8:22-26, forms the Dedaction Section of Mark (Mk. 8:27-10:45)(Mally 46). Mark 10:46-52 is a miracle story (Taylor 120; Bultmann 213). Clearly, its purpose is to present Jesus as the Divine Healer. It served as a encouragement of the faith in the Early Church. Mark 10:46 starts with two totally different chronological statements. Mark and Matthew claim that the time of the occurrence of the story was as they were leaving Jericho. Luke states that it was as they were approaching the city (Lk. 19:1-10). Furthermore, Mark names the blind man, while Luke does not record his name. Matthew records two blind men instead of one, which is an expression of Matthew’s tendency to emphasize the miracle works of Jesus. There is agreement in all three accounts of the place where the miracle occurred, as well as the crowds that were present. In 10:47-48 Mark and Matthew omit the question of the blind man/men who is going by. The prayer of the blind man/men and his/their dialog with the crowd remains fairly the same through the Gospel accounts. In 10:49-50 Matthew and Luke reduce Jesus’ response to the prayer of the blind man/men recorded by Mark in details. In 10:51 the dialog between the blind man/men and Jesus remains the same, beside that Mark uses “My teacher,” while Luke and Matthew write Lord. The emphases of the word is that the blind man saw Jesus as Lord, while the disciples did not realize this fact. Comparing to Mark 10:52 Matthew records the compassion of Jesus; however, he omits Jesus’ words which have a reference to the faith of the blind man/men. It also seems like Mark does not mention one of the blind men in his early records. Matthew talks about both of them together. Luke places one of them at the entrance of Jericho, the other one in the city (Lk. 19:1-10). However, all three of the Synoptic writers agree on the immediate healing. Luke also adds the reaction of the crowd. From the position of my literal interpretation and denominationally formed understanding of Mark’s account, I agree with the Markan authorship of the Gospel, the year and location of its writing, and the audience and purpose of the author. I am also convinced, that Form Criticism can most effectively follow the formation of the Markan text, and establish the basic original narratives for its development. It seems only appropriate to accept that because of its textual length, linguistic peculiarities, and doctrinal development the Markan account has a chronological and formative priority compared to Matthew and Luke. The use of Q-source is reasonable and essential in explaining the synoptic problem. Therefore, proper, scholastic Markan interpretation is intensively based on these theological grounds. Anderson, Hugh. The Gospel of Mark. Greenwood: The Attic Press, Inc., 1976. Beare. F. W. The Earliest Records of Jesus. New York: Abingdon Press, 1962. Briggs, R. C. Interpreting the Gospels. New York: Abingdon Press, 1969. Dowd, Shayn E. “Mark.” Mercer Commentary of the Bible. Macon: Mercer University Press, 1995. Mally, Edward. “The Gospel According to Mark.” The Jerome Bible Commentary. Vol. II. Englewood Cliff: Prentice-Hall Inc., 1968. Marxsen, Willi. Mark the Evangelist. trans. James Boyce, etc. New York: Abingdon Press, 1969. Perkins, Pheme. The New Interpreter’s Bible. Vol. VIII. Nashville,: Abingdon Press, 1995. Stein, Robert H. The Synoptic Problem. Grand Rapids: Baker Bookhouse, 1987. Taylor, Vincent. The Formation of the Gospel Tradition. London: Macmillan, Co., 1953.